Disappointed this time, since it wasn't as fresh and too hard to chew as compared to the previous time. Filling and lightly sweet snack. Very mild taste. Can get a little 'woody' if you eat too many at a time. Great healthy snack that is safe for school lunches. My kids really like to snack on these after school too. Telly adore these. I prefer the skinless ones as they are easier to eat. I have absolutely fallen in love with these things. Very satisfying and good for you! 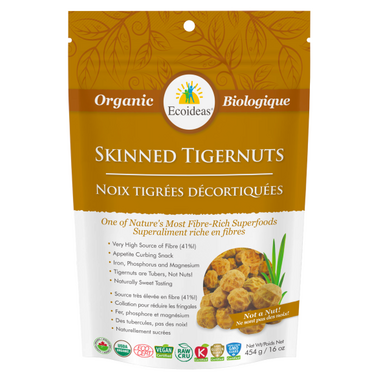 I read about tiger nuts by chance, and was intrigued by their nutritional benefits. Bought a bag to try. I just love them! I soak them in water overnight. I grind them and add them to my daily oatmeal and yogurt. Delicious and satisfying, especially with the high fiber content. Tasty and great for those who have allergies because they are tubular. Nice treat. Because I'm intolerant of nuts and this is NOT a nut, but a tuber, it suits me just fine. I make milk out of the "nuts", then make a flour out of the pulp left afterwards. It works out very well for me. Oh, and it also makes a very good granola too! I tired these nuts as another alternative. They are super-nutritious, almost like a hazelnut but sweeter. Game changer! I like the taste. They are very hard - I usually soak them in water overnight. I tried grinding them dry in my spice grinder, which broke the grinder! I suggest buying the tigernut flour if you want ground tigernuts. Great for making tiger nut milk. Soak overnight in 4 times quantity of water than nuts, with a cinnamon stick and a cardomon pod, blend all together in morning and strain through cheesecloth. Super delicious. These are my new favourite snack. Great snack in the afternoon to curb hunger and a pick you up. Sweet and crunchy they can be very addictive. Be careful, they are very high in fibre and can upset your digestive system if you're not used to it. The product is good but I do not like the taste very much.